Today I am sharing examples of some Valentines card ideas that my friend Margaret and I designed using the Painted with Love Designer paper from Stampin’ Up! for our January Crafting event. Our crafting event on Saturday featured the Painted with Love Designer Series paper and the Sure Do Love you Stamp set from Stampin’ Up!. 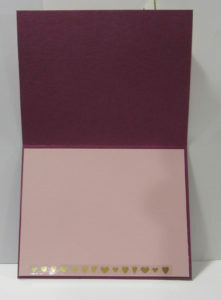 I love the look of this paper with the gold embossing and the beautiful colors. What a great combination of colors!! These cards use the Stampin’ Up! 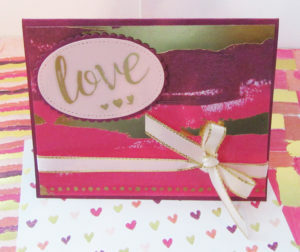 Painted with Love Designer series paper, the Sure Do Love you stamp set and the Painted Love Gold Vinyl Stickers. 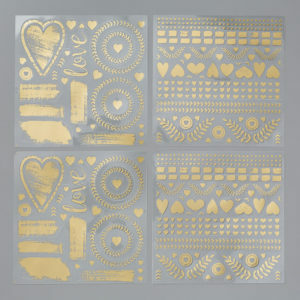 I love the Painted Love Gold Vinyl Stickers and have been using them a lot with the Painted with Love Desinger paper. 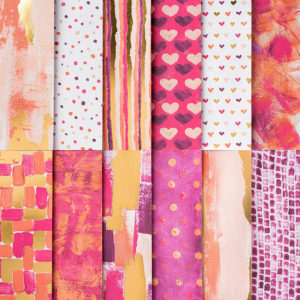 They are great for adding a little extra detail to a card front or that added touch to the inside of a card or an envelope. The “Love” is one of the stickers and I cut 3 hearts from a strip of hearts below the love. Also – notice the detail below the bow – this is one of the rows of stickers. A very quick and easy way to spruce up your cards!